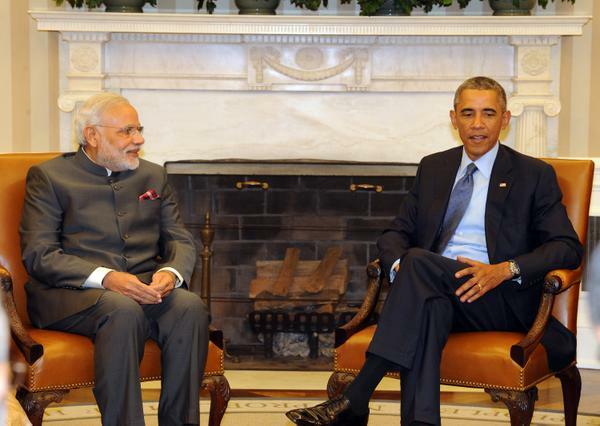 India and US have decided to renew a framework agreement for defence cooperation for a further 10 years. This was announced after talks between Indian Prime Minister Narendra Modi and US President Barack Obama at the Oval Office in Washington on Tuesday. The two leaders vowed to boost bilateral ties on energy, defence, security and infrastructure. The two sides have had differences over issues such as intellectual property rights and market access. “I urged President Obama to take steps whereby our service companies can get access to the American economy,” Modi said in Washington on Tuesday. The US treasury will initiate a joint investment platform with India “with special focus on capital market development and financing of infrastructure”, said a joint statement after talks between the two leaders..
Modi, who won a thumping mandate in May, has repeatedly vowed to improve government efficiency, speed up government approvals and keep corruption down. The Indian Prime Minister, on Tuesday, said he also discussed India’s decision to not sign the WTO trade treaty with Obama. “We had an open discussion on WTO issue. We support trade facilitation but a solution that takes care of our food security must be found,” he reiterated on Tuesday. US officials had seen the WTO agreement as a test of Modi’s intent to boost slowing growth, and as a way to revive bilateral relations. The WTO is adjudicating on more than a dozen cases between India and the US. A India-US Group will address implementation issues to deployment of US origin nuclear reactors in India, aimed at unblocking a major nuclear partnership with the United States. “We are serious about resolution of issues on both sides to enable civil nuclear energy cooperation to take off,” said Modi. Former Indian Prime Minister Manmohan Singh had in 2005 inked a landmark nuclear cooperation agreement with former US President George W. Bush. On Tuesday, Indian Foreign Ministry spokesperson Syed Akbaruddin also said US will be the lead partner in developing Indian second-tier cities of Allahabad, Ajmer and Vizag as “smart cities”. Washington and New Delhi has also launched a new US-India Partnership for Climate Resilience to advance capacity for climate adaptation planning. The two leaders also discussed global hotspots, including Afghanistan and the growing threat of Islamic State fighters in Syria and Iraq. “We both are committed to helping Afghanistan and improving our coordination in this area,” said the Indian Prime Minister. India-US trade reached an all-time high of over $63.7 billion in 2013, with a nearly $20 billion balance in favour of India, official figures released for the year disclosed in February this year. The US is eager to extricate itself from military conflicts in the Middle East and deploy attention to Asia where, as US President Barack Obama put it earlier, “the action’s going to be.” Many see the American Asia pivot as a bid to contain China. dealing with fascists is never prudent business. US is now but a nation run by wars, debt and chaos.